Digi VoLTE (Voice-over-LTE) Is Now Available! Shah Alam, 26 October 2016 – Digi Telecommunications Sdn Bhd (Digi) today announced that the Digi VoLTE (Voice-over-LTE) feature is now available on its 4G LTE network nationwide. VoLTE is a next-generation voice call technology that allows customers to enjoy better voice call quality for those with VoLTE-capable devices such as the newly launched Apple iPhone 7 and iPhone 7 Plus. With Digi VoLTE, voice calls are connected over a 4G LTE network. Up to now, cellular voice calls in Malaysia for all telcos are generally made over 2G and 3G networks. The higher bandwidth of the 4G LTE network makes it ideal to transmit higher fidelity voice calls that Digi customers can now enjoy. Along with that, Digi VoLTE also comes with a noise cancellation capability that eliminates most background noise for a clearer call experience. Another advantage of VoLTE is that it allows customers to simultaneously surf the web, download or stream content from the internet at 4G LTE speeds while engaged on a voice call. Up to now, the need to use 3G or 2G infrastructure to connect voice calls means internet activity while on calls will not be as fast as experienced on Digi’s 4G LTE network. “We have been working hard to bring innovation to the market and VoLTE is one of the many things we have in the pipeline for our customers. This is yet another step forward as we move towards our ambition of becoming our customers’ favourite partner in digital life,” said Digi’s Chief Marketing Officer, Loh Keh Jiat. To enjoy these new features, which come at no additional cost, both devices making and receiving the call must be VoLTE-capable with the feature switched on and with both customers located within Digi’s 4G LTE coverage area. Digi’s 4G LTE network now reaches 78% of Malaysians nationwide in 225 major cities and towns making it widely accessible for those with the appropriate devices to enjoy an improved call quality. Digi customers who bought the newly launched iPhone 7 and iPhone 7 Plus will be among the first to experience VoLTE as the smartphone comes equipped for it. Customers with earlier versions of the iPhone, including the iPhone 6S, 6S Plus, 6, 6 Plus and SE will also be able to enjoy VoLTE calls as long as they’ve upgraded their iOS version to 10.1 and activated VoLTE from the device settings. 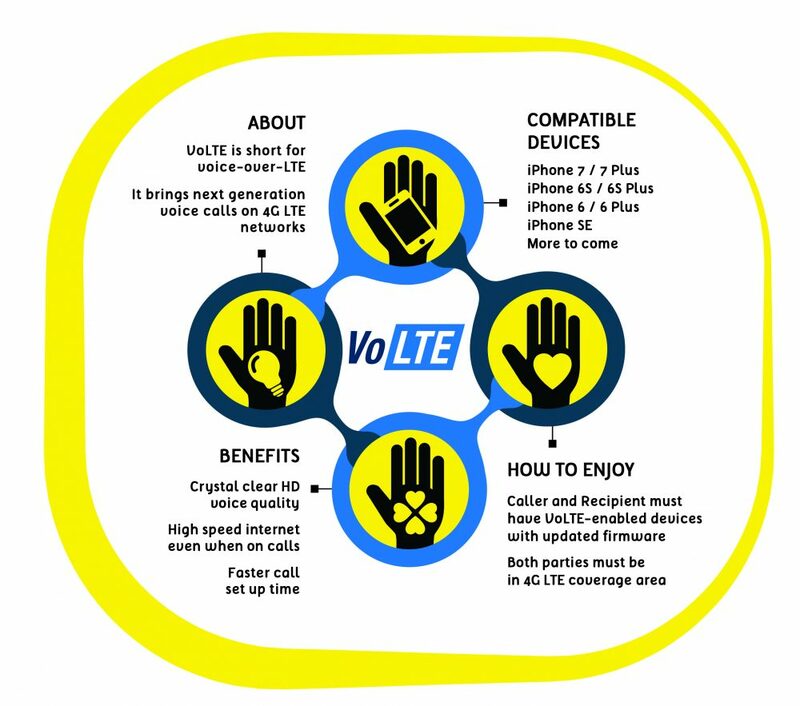 VoLTE capability in devices from other manufacturers will be rolled out soon in stages. Meanwhile, customers with devices that are not VoLTE-capable need not worry as there are no changes to the way they enjoy Digi’s voice calls.